On Friday, March 16, 2018, Juana Ojeda Mendez Ramírez, affectionately known as Juanita and Pita, entered her Father’s kingdom at 78 years of age. Juanita was born in Naguabo, Puerto Rico on November 20, 1939; the daughter of the late Martin Ojeda Mendez and Eustacia (Anastacia) Ramirez, and a sibling to three brothers and four sisters. Juanita moved to Wilmington, Delaware in 1956 and gave birth to Santito Rivera that same year. She moved back to Naguabo, Puerto Rico and later gave birth to Nani Fontanez, and in 1965 moved back to Wilmington, Delaware where she raised her family. Pita loved and doted over her children, her grandchildren, and first great granddaughter, all whom she helped raise. Her eyes always lit up at the mention of their names. Her grocery shopping consisted mostly of whatever foods they liked to eat, placing her wants and needs last, and often took them on excursions to the corner store for candy and ice cream. She will be remembered for many things, one of which is her cooking. She enjoyed cooking, and everyone enjoyed eating it, especially her mondongo, gandinga, and pasteles which were a huge hit around the holidays. She always cooked for an army just in case people stopped by. She was also known for being feisty, even though she was only 5 feet tall. In her younger years, she enjoyed listening to music by Lily y Su Gran Trio, Trio Los Condes, and music of the same genre. In her later years, she preferred listening to Salsa and Merengue music; merenguero Juan Luis Guerra being her favorite. Christmas was one of her favorite holidays – Thanksgiving being her second – and Christmas wasn’t official until her Christmas tree was up and decorated. Her Christmas tree normally stayed up until the end of January. 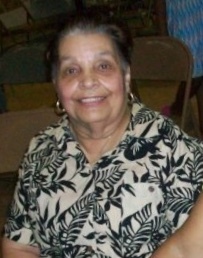 Juanita loved to laugh and enjoyed making those around her laugh as well. She enjoyed playing bingo with her friends and dominoes at family functions. She loved and enjoyed visiting and spending time with her siblings, as well as her family visits to Puerto Rico. In September of 2008, Juanita moved to Ingleside Assisted Living because of dementia. Her condition got progressively worse, and in June of 2011, she was moved to Kentmere Rehabilitation and Health Care Center, along with her brother Jose, which became her home until she was called to the almighty Kingdom after a long battle with Alzheimer’s disease. Juanita is survived by her sister, Josefina Alverio, her daughter, Nani Moreno (Fontanez), her grandchildren, Lechelle White (Piner), Martin Rivera, Joseph Piner, Jr., Tatiana DeAngelo, her great grandchildren, Inajé Johnson, Jenny Piner, and Maleia White, and a host of nieces, nephews, and cousins. She was preceded in death by her father, Martin Mendez and her mother Eustacia (Anastacia) Ramirez, her siblings, Agapito, Celina, Irma, Gloria, Pedro, Jose, and her son, Santito. A special thank you to Kentmere Rehabilitation and Health Care Center, specifically the third-floor nurses and nursing assistants, where Juanita affectionately called her home. The visitation will take place on Saturday, March 24th from 8:30 to 10:30 a.m. at Corleto-Latina Family Center, 807 North Union Street, Wilmington, with funeral services starting at 10:30am. The internment will be at Cathedral Cemetery immediately following the service. In lieu of flowers, contributions may be sent to a charity of your choice in Juanita’s name.